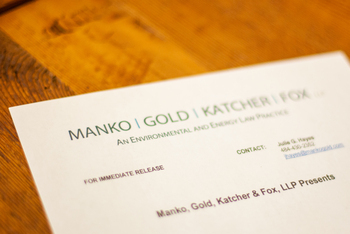 Philadelphia, PA (May 2, 2011) – Joseph M. Manko, founding partner of Manko, Gold, Katcher & Fox, LLP, the environmental, energy and land use law firm, spoke at a recent program entitled "Builder Developer Summit" presented by Wells Fargo Home Mortgage. Held on April 27, 2011, he was a panelist at the Summit held in Conshohocken, PA, and offered advice to residential developers. Manko focused specifically on how to obtain approvals from regulatory bodies, including the "host municipality," how to overcome environmental constraints on development, as well as green marketing. Together, the panel led discussions on cutting-edge strategies for increasing buyer traffic, tips for capturing more sales from that traffic, economic forecasts and updates on what is happening in the mortgage and new construction industries today.